These lecture notes have recently been reprinted and updated. The explanation of the Three Card Monte routine has been greatly expanded and illustrated. I have also added a section on one of my pet routines, the Two Card Transposition which i use every time I perform and is the video below. Still only $10. Here are some of my pet routines. No “pipe dreams” here, these are tricks that I make my living with. The Color Changing Deck and the Three Card Monte routines alone are worth the price of the book. This booklet also includes thoughts on style and the use of giveaways with a wonderful trick for special occasions like a birthday or an anniversary. 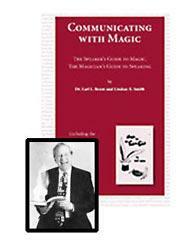 There are also some valuable thoughts on the business of magic. This new reprint is a mixture of theory and tricks and contains something for everyone, from the seasoned professional to the restaurant worker to the absolute beginner.